Plus interviews with two top pros in the new issue – on sale now. 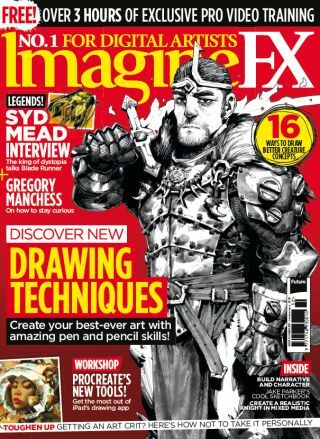 Learn to create your best-ever art with the amazing pen and pencil skills explored in ImagineFX issue 155 – on sale now. Inside the latest issue you will find out how Andrew Marr created our stunning cover art. In the tutorial he shares plenty of pro secrets, so you're bound to learn a new technique to give your own art a boost. Also in issue 155 is a workshop on how to create a clear story and memorable character designs in Photoshop. We also review the latest software and books that digital artists need to know about, plus we showcase the best artwork sent in from our talented readers. And that's still not all. Take a look at these features below to get a look at what else is in store with issue 155 of ImagineFX. Receiving a critique on your art can be tough. But remember, this is one of the most important ways to improve your work. We chat to leading artists to find out how to make the most out of a critique, as well as learning how to not take the feedback personally. Self-described visual futurist Syd Mead has defined the look and feel of some of cinema's most iconic sci-fi films. Ahead of the release of a book dedicated to his design work, we talk to the artist about his impressive career. When it comes to creating his amazing art, Gregory Manchess wants to forge an emotional connection with the viewer. ImagineFX interviews the freelance artist to hear how he stays curious and creative. The ridiculously talented Andrew Marr takes us through how he created the fantastic cover art that graces the cover of ImagineFX 155. This is a valuable chance to learn from one of the best illustrators in the business, and you're sure to pick up some pro secrets. If you want to create fantasy creatures with purpose, there of lots of tricks you can fall back on. Creature designer Bobby Rebholz shares his techniques for making fictional beasts look as real as possible, and why this will improve your art.